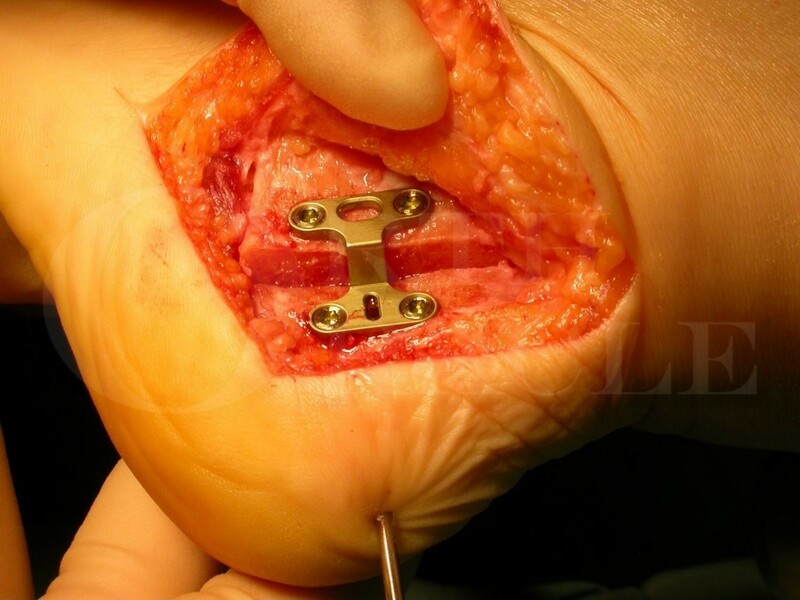 Learn the Calcaneal osteotomy with OrthoSolutions FRS Locking Plate surgical technique with step by step instructions on OrthOracle. Our e-learning platform contains high resolution images and a certified CME of the Calcaneal osteotomy with OrthoSolutions FRS Locking Plate surgical procedure. A Calcaneal locking plate provides very robust fixation and optimally maintains the hard fought for displacement achieved performing a Calcaneal osteotomy. It is associated with low rates of implant removal and does not require image intensification necessarily during operation. However it self evidently requires an open technique , as opposed to screws which can be used with minimally invasive/percutaneous techniques. It is possible to fix the osteotomy in distraction at the osteotomy site unless care is taken.